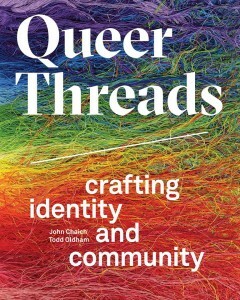 Inspired by the traveling exhibition [Queer Threads: Crafting Identity & Community] that debuted at the Leslie-Lohman Museum in 2014, this full-color coffee table book features an international, intergenerational mix of contemporary LGBTQ artist remixing fiber crafts, interviewed by a range of culture makers including Jonathan Adler, Justin Vivian Bond, Michael Cunningham, Tim Gunn, Kathleen Hanna, Glenn Ligon, Bill T. Jones, and more. Launch event will feature DJ JD Sampson, champagne toast courtesy of Verity Wine Partners, and silent auction of limited edition tote by artists Chiachio and Giannone. Published by AMMO Books, on site book sale courtesy of The Bureau of General Services Queer Division. ‘Designed by Todd Oldham and edited by John Chaich, this 192-page, hardcover, 8 x 10-inch book features full-color spreads of each artist’s work, along with intimate details of selections and artist studios, as well as an introductory essay by Chaich, who curated the exhibition of the same name that inspired this book.